Reach your customer in their native language! Finding the right language service is particularly important for the marketing teams! Whether you are trying to reach customers on the other side of the world or communicate with them in your own country, our language services will help you. Translation mistakes are too costly to fix. It is imperative that your translation service provider has a flawless grasp on both linguistic and cultural nuances. Advertising messages must be translated in a way that delivers the intended meaning across cultures and invokes the desired action. Remember, the meaning behind a single word can be interpreted in a vastly different fashion in another country. We care about your message as much as you do! 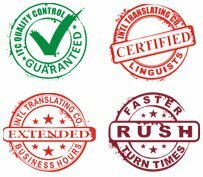 At ITC, we understand the importance of accurate translations that are easy to order and quickly delivered. Our translation services are provided by qualified advertising and marketing specialists, who are fluent in both the source language and target language of each document. We take pride in offering specialized translation services specifically for the advertising and marketing industry at the best possible prices.